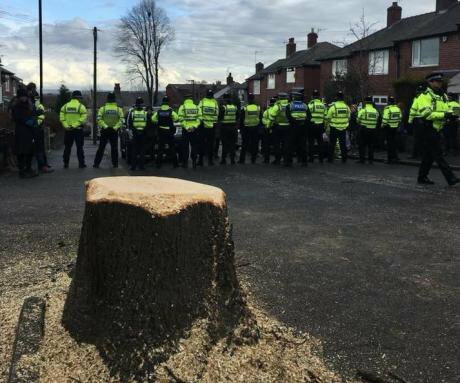 As the policing of Sheffield tree protests gets even more heavy-handed – with one woman arrested this week for ‘blowing a horn’ – it’s time to ask serious questions about South Yorkshire Police. Again. This is why 32 police descended upon a quiet residential neighbourhood. Photo by Anne Goodenough. South Yorkshire Police have, it is fair to say, a troubled history with the people that they are here to serve. So why are they allegedly allowing representatives of multinational firm Amey into the control centre to oversee footage of peaceful tree protests? No protestors are accorded the same luxury – even though complaints have been made by both sides. And why, when the police authorise “reasonable force” against protestors, do they not seem to have a good plan for handling medical emergencies in the midst of a forest of barriers – nor able to make sure the force really is proportionate to the crime? The Sheffield tree saga started with a 25-year PFI contract signed in 2012 with multinational company Amey to maintain Sheffield’s roads, pavements, and trees. This contract has proved immensely controversial, as Amey has been felling (or attempting to fell) huge numbers of healthy trees against both residents’ wishes and expert advice. It has led to a remarkable and agile protest movement, ready to defend trees across the city at a few moments’ notice. The South Yorkshire police first became seriously involved when they assisted Amey in a pre-dawn raid back in November 2016, waking residents of Rustlings Road before 5am, insisting that they move their cars, and arresting the pensioners in their nightdresses who refused to comply. This incident attracted so much attention that the police ended up apologising, and emails revealed that they felt they’d been “thrown under the bus” by the council. A few months later, the police were back, arresting tree protectors standing under trees under Thatcher-era anti-union laws. After these cases were dropped, Police and Crime Commissioner Alan Billings said on 15 March 2017 that the police would no longer be arresting peaceful tree protectors. Sheffield City Council decided to turn to civil remedies, requesting and (in August 2017) receiving a civil injunction to prevent protestors from being inside safety barriers around the trees. Using this injunction, they attempted to imprison two protestors. One had deliberately committed civil disobedience and was given a suspended sentence and an exorbitant demand for legal fees. The other was an opposition councillor who was entirely innocent—the case against her was dismissed by the judge before she could even testify. Because of the wording of the injunction, protestors were still able to save many trees over a period of months by peacefully standing on the pavement before barriers had been completed. But on 28 November 2017 Amey and the Council brought in an army of paid security guards. At the same time, they posted signs which changed the wording of the injunction in crucial ways, making it appear it covered actions that it did not, in fact, cover. After Louise Haigh (MP for Heeley) spoke out against this escalation on 22 January there was a lengthy “pause” in fellings, and some hope that the council and police would see sense. But on 25 February Assistant Chief Constable David Hartley announced instead that a return to fellings with an increased police presence. He laid all the blame for this on the behaviour of protestors, insisting that the security guards had been professional at all times. This led to scenes of 30 or so police and a similar number of security guards, several riot vans, CCTV, huge fences, shutting down entire residential streets, while screaming protestors, most of them elderly, are pulled away from healthy trees. Despite this escalation, police seem not to have planned for the logistics of a medical emergency. When security forces knocked down an elderly woman in their zeal to reach another protestor, she needed medical attention. Police wanted to take her to the hospital, but one initially told me that they would not be able to, due to all the barriers. They had great difficulty getting her to their van, since they did not have a stretcher despite the planned use of force. A couple of days later, riot helmets were brought out at another scene attended by 30 officers. Is this a sensible use of police time? The next day, a small, quiet 74-year old former firefighter at a protest was abruptly arrested for allegedly intimidating one of the large burly security people. In the light of the most recent issues, Sheffield Councillor Lord Scriven wrote a strongly-worded letter demanding answers over South Yorkshire’s policing. Assistant Chief Constable Hartley responded by suggesting the police needed to match the 90–100 mostly grey-haired protestors one-on-one. And even as this remarkable use of force is ongoing – and contrary to repeated claims otherwise the contract commits the city to felling half of its street trees. Outrage at this has attracted both national and international attention, and led three of the city’s MPs to call for a halt to fellings and a negotiated solution. But the police response has been to dig their heels in yet further. The Chief Constable has now also responded to Lord Scriven, revealing that Sheffield City Council and police commanders sit in a control room together, directing the protest policing via CCTV. At a felling on 13 March (approximately 21:40 on this video), a Police Liaison Officer indicates that his understanding is Amey were also in the control room. The police have insisted throughout that they are acting in a completely impartial manner, seeking only to keep the peace between the various parties. It is difficult to understand how such impartiality can be maintained if Amey and the Council are in the control room with them, and no tree protectors are. There are further doubts about the accuracy of police claims. Police Commissioner Billings has said in writing that he has received no complaints about excessive use of force by private security. However, a protestor who was injured in an assault by private security wrote to Billings about this, and Billings replied — well before his email stating that he had received no such complaints. Just this week, events have further cast into doubt SYP’s claims of impartiality. A 61-year old woman was dragged to the ground by security personnel, injuring her hip. One then kicked her in the head stepping over her (although there was plenty of space to walk around her), causing a large lump. When she tried to file an assault charge with some of the dozens of police on the scene, they told her to go report it at the station. On the very same day, however, they arrested protestors on the spot for swearing and for blowing a horn. Meanwhile, knife crime and daytime burglaries are on the rise, and neighbourhood watch groups report that police are taking weeks and even months to investigate violent assaults. What are the South Yorkshire Police doing? Why are they so willing to allow the use of force on peaceful citizens for incredibly minor offences? Why are they willing to put dozens of their officers on the scene of peaceful protests? How on earth do they think it is a good idea to oversee these operations in collaboration with a private corporation? Why aren’t they being honest with us? And most of all, why is Sheffield’s Labour council so devoted to the defence of a PFI contract with a multinational company? To learn more about the Sheffield trees saga, see Save Sheffield Tress. There is now substantial evidence that the council could end the PFI contract without penalty, due to Amey’s failure to disclose health and safety issues. To sign a petition urging them to do so, go here.